Heres the exploit: If you dismount just at the moment that another player presses the mount button on your bugged mount, the player will mount YOU! This is how things look from your side. To other players and to the player on your head, it will look just like the other player is mounted on your mount as would happen in the elevator, except for the fact of course that you're never dismounted. 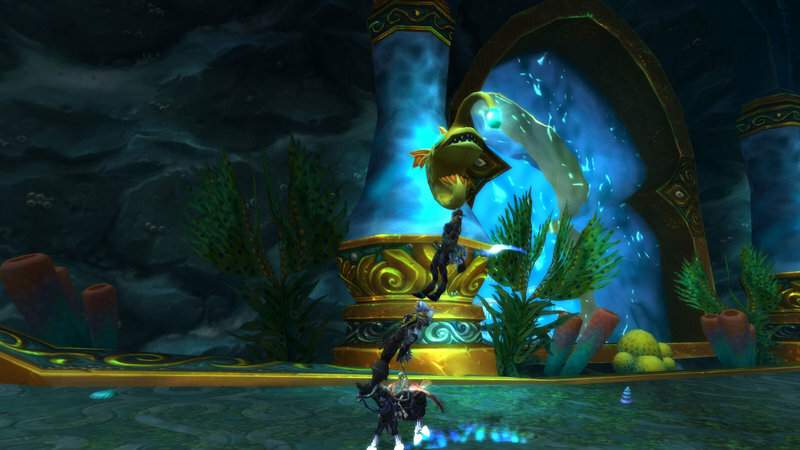 Above you see me doing a front flip with a shaman stuck on my head, I have run the tests, and this is 100% hilarious. Secondly, you might notice that the shaman seems to be doing an action in the first picture, that is because he is! While on someones head, and while someone is riding on your head, you maintain full control of your characters spells and abilities, with the notable exceptions of eating and drinking, and of course being able to move anywhere where the "mount" does not want to go. 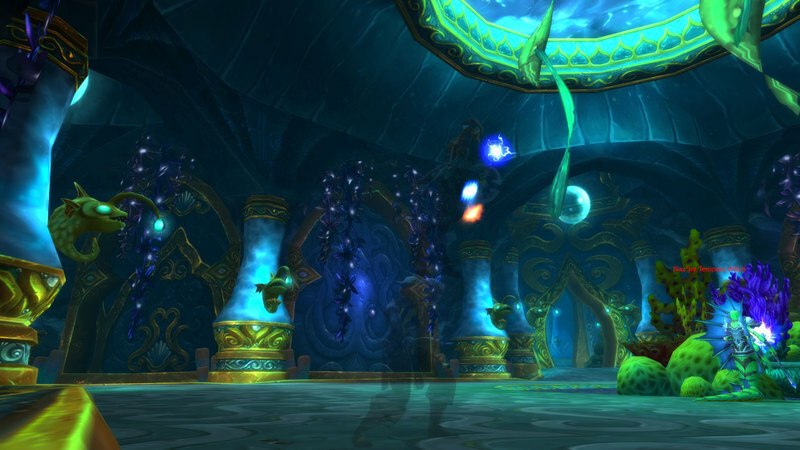 Note in particular how stealthy the shaman is, shamans are not naturally stealthy. I have not tested the implications of this particular trait yet, but I presume it might mean that if you "mount" a warrior, then you might benefit from his stance bonuses, if you mount a DK you might benefit from his aspects and so on. I haven't tested that last part though, so that's up to you to find out. For a caster, being mounted on someone also has the added benefit of giving you the ability to cast while your "mount" is moving, essentially turning you both into an unstoppable death turret. Other then that, combat functions normally as one would expect. The best part of this, however, is yet to come! I present to you...exhibit D! Yes, you are seeing this right. It is a shaman, on a rogue, on a Death Knight who is riding his Death Charger, WHILE DRINKING NOGGENFOGGER! This seemingly impossibly impossible impossibility is made possible with the magic of huge jellyfish elevators. The DeathKnight in this case is not really on his mount, but I see it that way as I mounted him, and any effect he applies on himself is simply shown on him as he would be mounted. As mentioned earlier, auras such as stealth is only applied to people ABOVE you, thus the DeathKnight in this case will not benefit from it. However the shaman can attack continuously while in stealth, as it does not break until the original caster breaks it (not that this has much use within an instance, if the shaman aggroes a mob, it goes on the rogue in despite of stealth). However, there is seemingly no limit to how many people can mount upon each other (although i havent tested this yet), meaning that your entire party can mount upon each other, and then upon the tank. Note that range issues still apply, so third place up in the tower will not be able to reach ground mobs with melee attacks, however with 3 ranged dps and a healer stacked on a tank, you essentially turn into an entire party on a stick. 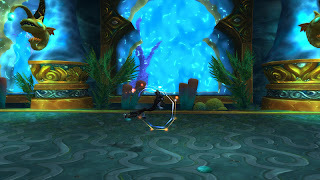 This will let you easily own the entire instance with the exception of the last boss, as you do not gain the damage buff at the end of the encounter in this state (However, as long as the tank can be healed through the debuffs, you are immortal, so killing the squid is still possible in this state). As a final note, id like to give some advice on how to do this bug, as the timing can be quite tricky. 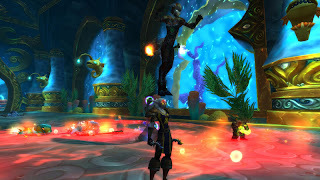 When we did this, we were three guildies sitting in TeamSpeak and counting down to get the timing right, something which i would recommend (but with five guildies of course ). With my latency, the right time to press dismount was roughly 0.2-0.4 seconds after having said "MOUNT!" on Team Speak (which is when the other player was supposed to click me to mount up). This may vary depending on your friends and your own latency. If the target moves up towards your head but then suddenly "dismounts" in mid air, you are dismounting to late. On a successful "mount" the player moves smoothly from the ground up on your head about half a second after you have dismounted.